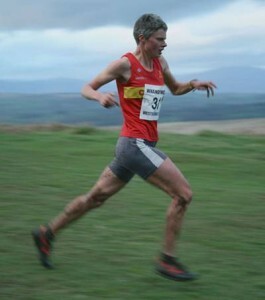 Angela Mudge in the Carnethy colours at the Ben Nevis Hill Race in 2008. In the course of my running career I ran in several hill races (eg the Mamore Hill 4 times) and ran well in none of them. I have also officiated at the Arrochar Alps and the Kilpatricks races – several times at each and have nothing but admiration for the skills, bravery and intelligence for those who can compete successfully in this most demanding of athletic disciplines. I once had the privilege of sitting listening to Bobby Shields reading a map of an up-coming hill race and it was like anyone else reading a book (there’s a dip between these two tops, we call it a saddle, and there’s a burn running down from the middle so if you go just west of where the burn is, then ….) He hadn’t seen the map before and he was reading direct from the OS map. You can’t be stupid and a good hill runner at the same time. I have spoken to sever of these athletes and know from direct experience that that is true. One of the best we have had in Britain is an English born woman who has run her entire career for Scotland – Angie Mudge is world famous. We just had to include her here. A mountain to climb? Mudge now at her peak. Leading endurance athlete tells Doug Gillon she is now ready for the ultimate challenge. In some sports Angela Mudge would travel business class with a retinue of managers and medics, living in five-star luxury, her future assured by whacking endorsement income and prize money. Her recent winnings were a Swiss cheese and a voucher for a bunch of flowers. She declined. Vases, when you live in a tent, are excess baggage. Hill-running is an under-estimated discipline. As befits its rigours, competitors take life and hazards in their stride. Mudge has spent two months during the past year on crutches after radical surgery to correct a serious knee problem that already had her considering alternative sports. “I’d worn away all my knee cartilage – more to do with my running style than with the sport itself,” she said. “I was running on the bare bone of my femur, so the surgeon drilled a lot of holes, which stimulates scar tissue and I could run again. My knee was more painful afterwards than before, I was prepared for that, but was allowed to run for only 10 minutes even months after the operation. I deliberately did not ask about the success or failure rate in order to keep a positive frame of mind. It was only six months later that a physiotherapist told me that there were lots of people for whom the operation did not work. Taking rehab slowly has been the key to success, although I had plantar fasciitis which put me out of action again from the end of May to the beginning of July this year.” Since then she has recovered dramatically training for five weeks and racing four times in Switzerland. “I won three races and was second in the Swiss Championships on the Matterhorn. there was a raclette cheese for winning one race and a 50 franc voucher from a flower shop for another which I gave back. There was nothing for the third but it’s not about the prizes.” Mudge reckons she is short of the form required to reclaim the individual crown at the world mountain running trophy, but still believes the Scottish women’s team can be on the podium. In her final race before her departure for Wellington, where she leads the Scots on Mount Victoria, Mudge won the world masters title in the Lake District by nearly three and a half minutes. “It was the first time I’d raced downhill since the operation,” said the 35 year old Carnethy runner. 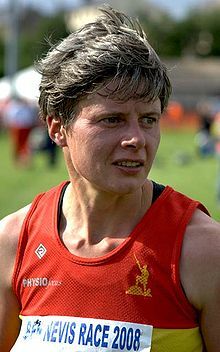 In 2000 Mudge won the world title, while in 2003 she won silver and led the Scottish team to gold in the only athletics discipline in which Scotland now competes at world level. Overtaking on some descents can be more hazardous than on a Formula One racetrack. Mudge is a former winner of the world climbathon on Mount Kinabalu in Borneo where there were sheer drops. She had to sign a disclaimer absolving organisers from liability. Little wonder. This was the mountain on which ten British squaddies got lost for several weeks yet it was all in the day’s run to Mudge. She has raced in New Zealand before having speent six months there with a boyfriend. Laureus tried to tempt her home when she was short listed for the world extreme sportswoman of the year title but she declined the all-expenses trip. The only other British nominees were in other categories. Steve Redgrave, David Beckham, Jonathan Edwards and Lennox Lewis among 75 luminaries boasting 316 Olympic and World titles at a glittering gala dinner in London’s Albert Hall. Mudge preferred a meal cooked in the open “and camping in a tent high up in the Southern Alps”. She added that she did not possess a little black dress and would only have wandered around collecting autographs. Mudge overcame being born with her feet facing the wrong way and the boredom of track running as a teenager – she has never done it since – to become Britain’s greatest hill racer. She has collected the UK cross-country title and contested the world championships in that discipline along the way, but the hills are where her heart lies. “Before this latest operation I was unsure whether I would be able to carry on running. I would just have picked another sport, like cycling, which is compatible. It was always in the back of my mind. I’ve set no goals for New Zealand. It’s more of a trail race than open mountain so it will be quick and I’m not as sharp as I’d wish. It would be stupid to focus on the top fve when I could finish fifteenth and still have an excellent run, but I think we can medal if all the girls run well.” The Standard Life Scottish team includes Tracy Brindley, the 2003 individual world bronze meallist, and British champion Jill Mykura and runner-up Sula Young, but is minus Lyn Wilson, Mudge’s clubmate and former world gold medal team-mate who tackles the Berlin Marathon tomorrow. That’s the end of Doug’s article and she did indeed run in the World Mountain Running Championships that year – and won the W35 age group race while finishing 20th overall. That will give the whole story of the wonderful career of Angela Mudge. I will add to this page later but you will already have noted a lot about her character, her integrity and her competitive nature from Doug’s writing.